These days a Windows computer that’s not fully up-to-date with the latest antivirus updates and software patches can cause system instability, problems or network wide issues. Any downtime can damage your organization. If you’re a small-to-medium sized business, let our protection monitoring service offload the burden of constant monitoring from you. We call it Nero CloudProtect, a complete solution to keeping all your computers healthy, up-to-date and protected from malicious threats. 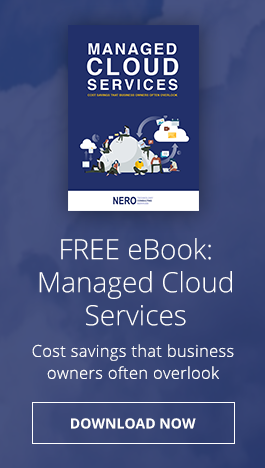 Nero Consulting’s CloudProtect software works for you 24 hours a day, 7 days a week, 365 days a year. Best of all, it never gets sick, comes in late, or takes a day off! It replaces the need for you to make an exorbitant, upfront investment on expensive technology or hire a full time IT employee. Automatic remediation for any security issues that are found. Automatic patching of missing security updates to common software such as Microsoft and Adobe. Scheduled scanning and reporting on a regular basis of visible health checks and threats. For larger companies with existing IT departments, we can assist in running daily routine checks while your IT staff focuses on bigger issues. All monitoring is proactive. So most of the time we will spot an issue before you even realize it was there, and we get to work immediately.